Few people think of unions or the plight of the working class when they think of Memorial Day. But they should. 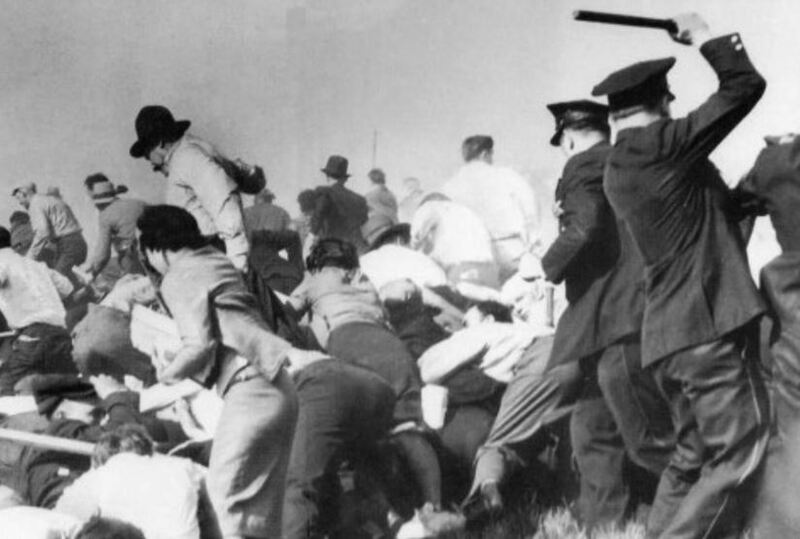 On that day, eighty years ago, one of the most important events in American history unfolded, an event that transformed the course of labor rights in this country. In 1937, most of the country celebrated Memorial Day on May 30, which was a Sunday. In Chicago, the holiday could not have been better accommodated by the bright and warm weather. This made the city’s southernmost reaches an incongruous backdrop to the killing that day of ten unarmed men by the Chicago Police. This incident, known as the “Memorial Day Massacre,” is what makes this holiday so essential to American history. The men who were killed were among 1,500 striking steel workers and their supporters who had marched on a plant owned by the Republic Steel Corporation. They were associated with a new labor federation called the Committee for Industrial Organization, or CIO, which in the space of a year had managed, often by audacious and militant strikes, to build unions in long-time anti-union strongholds like General Motors and US Steel. Republic was a powerful company, one of the largest steel producers in the world. It stood at the head of a coalition of corporations, industry groups, and wealthy people who were intent on destroying the CIO. In fact, the broader aim of this coalition, which counted among its key members the National Association of Manufactures, the Chamber of Commerce, and a semi-fascist organization called the American Liberty League, was to undo the entire New Deal. Accomplishing this required defeating the CIO, which had emerged as an increasingly powerful ally of the Roosevelt administration. It also required finding a way to undermine the National Labor Relations Act, or Wagner Act. This new statute was the legislative centerpiece of the New Deal. Just declared constitutional by the Supreme Court in April, it purported to protect the right to strike and engage in collective bargaining, and gave legal license to the CIO’s campaign. Backed by this coalition, Republic and several other steel producers known collectively as “Little Steel,” unleashed a counteroffensive. They responded to the CIO’s organizing efforts by firing, threatening, and assaulting hundreds of union supporters and categorically refusing to bargain with the union. This was all illegal. But Little Steel’s aim was not to abide by the Wagner Act but to nullify it. These practices provoked a strike which began on May 26 and quickly grew to include seventy thousand workers at thirty steel plants spread across the industrial heartland. The strikers demanded that the companies respect their rights under the Wagner Act, including the right to picket. And so it was that 1,500 people marched on Republic’s plant in Chicago, armed with signs declaring their right to protest, affirming their support for Roosevelt and the New Deal, and denouncing Republic and the other Little Steel companies. Their hope was to set up a mass picket line at the plant and draw out the thousand or so men who remained at work inside. Unfortunately for these marchers, whose ranks included over one hundred women and a fair number of children, workers’ lives didn’t matter very much for corporations and the government. In the Depression era alone, several hundred workers had already been killed in clashes with police, National Guardsmen, and company guards, who numbered in the hundreds at companies like Republic, Ford Motor, and Phelps Dodge. Occasionally, police and guardsmen were also killed or injured, along with loyal employees. But mainly, the victims of “labor trouble” were striking unionists. The people who killed them were almost never prosecuted, even though it was commonplace for the workers themselves to face criminal charges for the violence that was inflicted on them. Some of the details of what happened that Sunday are still uncertain. But this much is clear: The marchers were met near the plant gate by 250 members of the Chicago Police, who had been fed, housed, and armed by Republic. They stopped the marchers, cursed and threatened them, and ordered them to disperse. And then, with no real provocation, the police suddenly opened fire on the crowd. They fired over one hundred shots from their service revolvers and discharged gas they had been given by Republic. They set upon their injured and stumbling victims with hatchet handles — also given them by Republic. They beat grievously wounded people. They dragged dying men along the ground and out of improvised ambulances. And they arrested scores of people, including mortally wounded men in hospitals. Four men died that afternoon, six more in the days that followed. All were striking workers or sympathizers, and nearly all were shot in the back. Another one hundred were injured, dozens by gunshots and some by blows that left dents in their skulls. Of course, the police claimed they had only been defending themselves from a hostile assault by a well-armed force, addled with marijuana and Communist ideals. This was nonsense, as confirmed by both an investigation by a Senate subcommittee and an incomplete film of the event taken by a newsreel photographer with Paramount. But the truth didn’t much matter. The major papers and most politicians ignored the facts. The subcommittee’s work and the newsreel (which was barred from public screening in major cities) probably saved the leaders of the march from prison. But the Chicago Police and the men who ran Republic Steel escaped any criminal charges at all. Before the “Little Steel Strike” ended later that summer, at least six other people, all with the union, had been killed by police, guardsmen, and company loyalist guards in clashes in Ohio and Pennsylvania. In none of these cases was anyone with the government or the companies held responsible. Instead, the violence inflicted on the strikers helped break the strike. The strikers knew that they could never win the strike unless they closed the plants and kept them closed. But when they attempted to accomplish this with mass picket lines, they were forced aside. Nor did the Wagner Act provide much remediation. Although more favorable to workers than the labor law is today, the Wagner Act did not require companies to yield anything in collective bargaining. It accorded workers no means of pressuring employers except by striking. But it left the right to strike, including the right to picket, subject to the limits that state and local officials — like the Chicago Police — deemed necessary to control disorder. The Little Steel companies were eventually held liable under the Wagner Act for assaulting and threatening workers, for firing union organizers and supporters, and for refusing to rehire the strikers when the walkout ended. But ironically, by losing in court, they discovered how little they need have worried about the Wagner Act in the first place. The penalties they faced were strictly civil ones and didn’t amount to much. Republic, which paid the most, had to pay three thousand workers several hundred dollars each, on average, for holding them out of work for over a year — and they didn’t get paid for five years, by which time Republic was rolling in cash from war-related orders. At least three thousand other workers, illegally put out of work for over a year, got nothing. The Little Steel Strike was the last American strike in which more than a handful of people lost their lives. But it was also the last strike in which workers in really large numbers attempted by picketing and other acts of militancy to achieve basic rights in the workplace. More than any other event, the Little Steel Strike saw to that, serving up a clear notice to unionists that the many perils of militancy would all fall on them. Republic and the other Little Steel companies did eventually establish a collective bargaining relationship with the union involved in the 1937 strike. We know it today as the United Steelworkers of America. But this was mainly due to the CIO’s successful manipulation of the economic and political realities created by World War II. And so it has been since then. Unionized workers in steel and elsewhere realized great gains in the decades following that awful Sunday in Chicago. But these were achieved through a system of labor rights that has depended far more on the support of the government and the political maneuvers of union leaders than on the activism of workers themselves. It is therefore not surprising that unions today seldom ever strike and instead expend hundreds of millions of dollars supporting political candidates, hoping that this will accomplish for them and their members what they have long been unwilling to pursue on the picket lines. It is even less surprising that what remains of the labor movement finds itself on a precipice, its members often disillusioned and alienated, its power dissipated, its very future in doubt, even as tens of millions of workers suffer low wages, insecurity, and indignities not at all unlike what drove workers to the picket lines eighty years ago. Those of us who are outraged by these circumstances can blame them on many factors. But in understanding where American workers are today, we must not forget the kind of violence inflicted upon them that Memorial Day eighty years ago. Ahmed White is a professor of law at the University of Colorado-Boulder and the author of The Last Great Strike: Little Steel, the CIO, and the Struggle for Labor Rights in New Deal America .